As you may know, NYC has Free School Lunch for All in our Public Schools. As a result, it is no longer necessary for families to maintain a MySchoolBucks lunch money account for their students and we will be refunding all families with remaining balances. If you have a remaining balance for your student’s MySchoolBucks account, the DOE will refund you. A check will be mailed to the parent or guardian at the home address on file for the student. Please contact the main office by December 15, 2017 if your address changed since you last registered to make sure it is correct (changing on the Blue Card does not change the address in the DOE system). If you have any questions, please send an email to: SFLunchRefunds@schools.nyc.gov. Meet PTA Diversity Committee Chairs Abby Palanca and Shannon Tam and discuss PTA Diversity Committee goals, and start planning a winter event. Contact Abby or Shannon at PTA_Info@ps154.org with any questions. Please note that PS 154 schoolchildren can be dropped off as early as 7:45am in the cafeteria. All New York City residents with children born in 2013 can apply now to kindergarten until January 12, 2018 one of three ways below (PS 154 does not handle initial registration.). Info here. CITY OF SCIENCE is Back! 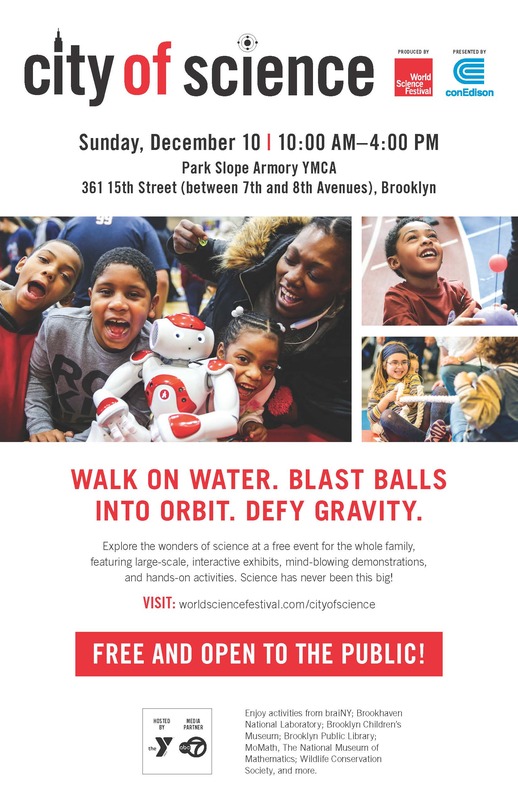 Once again, please join the World Science Festival and Con Edison to explore this FREE buzzing metropolis of larger-than-life interactive installations and hands-on activities. CITY OF SCIENCE is a fantastic opportunity to demonstrate the power of STEM through exposure to hands-on science that sticks with kids. Check out the FLYER.